It’s been five-and-a-half years since the US economy officially went into recession and three-and-a-half years since we entered the “recovery” phase of the business cycle. While technically in “recovery,” it’s no secret that when it comes to the labor market, workers are suffering the weakest turnaround in the post-WWII era. And despite what you may have read, the truth is we’re still nowhere near full employment — at least not if you’re honest and you’re counting everyone who wants full-time work and can’t get it. There are, of course, lots of things we could and should be doing to put millions of Americans back to work. For starters, we could begin chipping away at our $3.6 trillion infrastructure deficiency. Engineers, architects machinists and more could be called back into action to begin the important work of repairing and rebuilding our airports, bridges, schools, railways, energy grids, etc. Millions more could be absorbed back into private sector employment with a simple fiscal adjustment working through the payroll tax. A full payroll tax holiday would stuff the pockets of nearly every employer and employee in America, reducing the wage bill and raising the take-home pay of more than 150 million people by an average of almost $250 a month. The beneficial effects to the rest of the economy would be felt almost immediately as consumer spending boosted the sales and profits of millions of businesses across the nation. We could also create jobs directly by funding a grass-roots job-guarantee program run that could be run by the nonprofit sector. A New New Deal modeled on successful programs like the WPA, CCC or NYA could employ millions in just a few months time, taking anyone who was ready, willing and able to work but unable to find employment. But we’re not doing these things or anything else that’s going to help millions of workers who are struggling to get by. Until we start electing people who recognize that the federal government can and must act to reverse the decades long decline in the chances of succeeding in the labor market, the system will only work for a minority of us. If you have problems with the slides not advancing in Firefox, you can view the presentation on slideshare here. This entry was posted in Stephanie Kelton and tagged labor market. Bookmark the permalink. Not only are we not taking the actions that could help the economy, we are taking actions that directly harm the economy by sequestering appropriations, cutting emergency unemployment benefits to the long term unemployed, and reducing food stamps (SNAP program). Perhaps NSA has purloined the Japanese economic playbook and handed it to Obama. Hey thats not fair to our brother and sister Japanese. Look at their unemployment rates over there, since 1998 its been between 4 and 5.5%, rates we’d kill for. Their GDP numbers are misleading since their population is declining and their working age population is declining even faster. If your population is shrinking, you can technically increase your per capita financial wealth even with zero economic growth. Whereas our growth rates are high for a developed nation, so if our economy doesn’t grow even faster than our population, we become poorer. 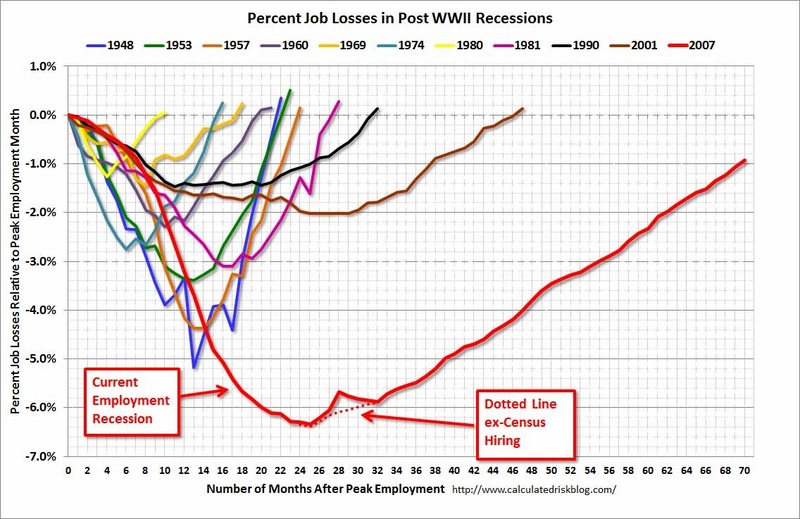 You reminded me of another wrong reason mainstream economists give for continued high unemployment – that our workforce is aging. Actually, that should just provide the opposite effect. In other words, a shrinking labor force ought to be easier to employ, not harder. After all, Seniors need all kinds of things, and a reduced labor force would have to provide those too. Of course, if we’re going to gut social security in the toxic belief that “we’ll run out of money” then, all bets are off, as is the country…. Structural unemployment is sure to get worse as intelligent machines replace workers on a massive scale. Within about ten years machines will be able to replace most clerical and information workers, and the gap between available and desired jobs will grow. 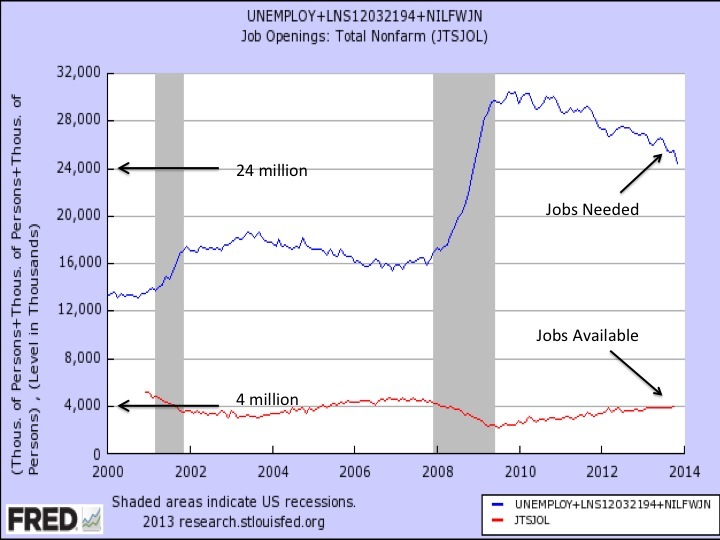 It is very possible that unemployment/underemployment could be 30%, 40% or more. Since health care is generally provided through employeers, both government-provided employment and benefits will be necessary. One trend not noted in the post is the fact that each of the last four recessions has taken longer to recover to the pre-recession employment level that the ones before it. This could be at least in part to the structural unemployment you describe. Dr. Kelton is very correct. The actions that would cure our economic problems are obvious; we need people in congress who can think and act to alleviate the problems and not cause more damage. The Fed is charged with maintaining “full” employment and now the Fed charter can only be withdrawn for “cause”. Perhaps it is a good time to beat the drums to end the Fed and install a truly democratic monetary system. The United States is a nation walking in the dark. On the podcast subject, could you interview people who can tell us how the British, Canadian, Japanese, and Australian sovereign monetary systems work compared to ours? I read that Canada doesn’t use reserves. Why? How does Australia do it? Do any of the other monetarily sovereign countries do it like we do? It would be interesting to know this because it would present options. The places struggling are all the elite businesses which rely on the money these workers spend. Apparently the DC elite have just decided they don’t want to make money.